A life-saving piece of equipment which had been feared stolen from a sports club, has been found, weeks after it went missing. The public access defibrillator was taken from the outside wall of the Alexandra Bowls Club, in Alexandra Park, some time over the weekend of November 12/13. It was feared the equipment could be dismantled and the pieces sold on eBay. But on January 5, the missing defibrillator was discovered dumped in the bushes at the park by a gardener. 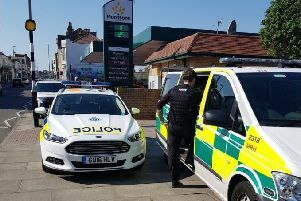 It was handed over to the South East Coast Ambulance Service (SECAmb) to be checked over before being handed back to the bowls club. Ian Wright, secretary of the Alexandra Bowls Club, said: “There would appear to be nothing wrong with it. It was not the first time the device had disappeared from the club. The defibrillator was presented to the club in March 2015. However, just three months later it was ripped from the wall and thrown into a pond. The defibrillator was paid for by the Sussex Heart Charity.